Thanks for visiting us! We have designed this site to be an open forum that includes a full disclosure about our organization, our objectives, our progress, a polling place and a place where both sides of our issues can be found. We have also included a place where you can join us in our quest, in several ways. 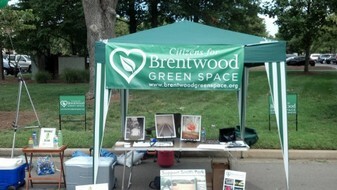 You will also find us on Facebook at "Brentwood Green Space" and on Twitter (@BrentwoodGreenS). CBGS seeks to unite the citizens of Brentwood, TN in support of its leadership in their quest to manage growth while preserving the quality of life and maintaining low tax rates. Key to meeting that objective is to preserve open space in the form of parks, trails, flood plains and historic sites while being sensitive to the rights of landowners and developers. CBGS explores and keeps citizens informed of viable means of preserving open land, the environment, and quality of Brentwood life. CBGS will propose initiatives, backed by informed citizens, in support of this mission.